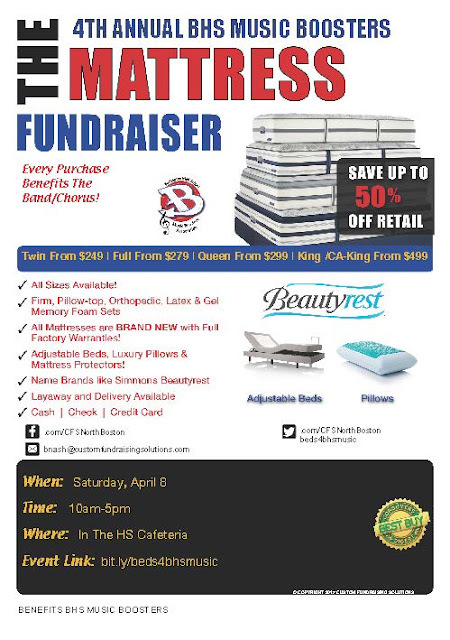 Burlington High School Principal's Blog: 4th Annual Mattress Sale ... Mark Your Calendar! 4th Annual Mattress Sale ... Mark Your Calendar! Even if you a just thinking about getting a new mattress ... you need to stop by BHS (Cafeteria) on Saturday, April 8th, from 10:00 am - 5:00 pm!!! Full showroom with 20+ different mattresses to try. Faculty/Staff & Families - COUPON ATTACHED. This is a great fundraiser that provides a great service to the Burlington Community! !